The other day, I overheard someone say, “Here is another new thing they want us to try.” This is not something new, I have heard this comment made many a time during staff meetings and PD days. It made me think is Universal Design for Learning (UDL) just another new thing that we are making people do? Will our practice really change? Last week my grandfather passed away. 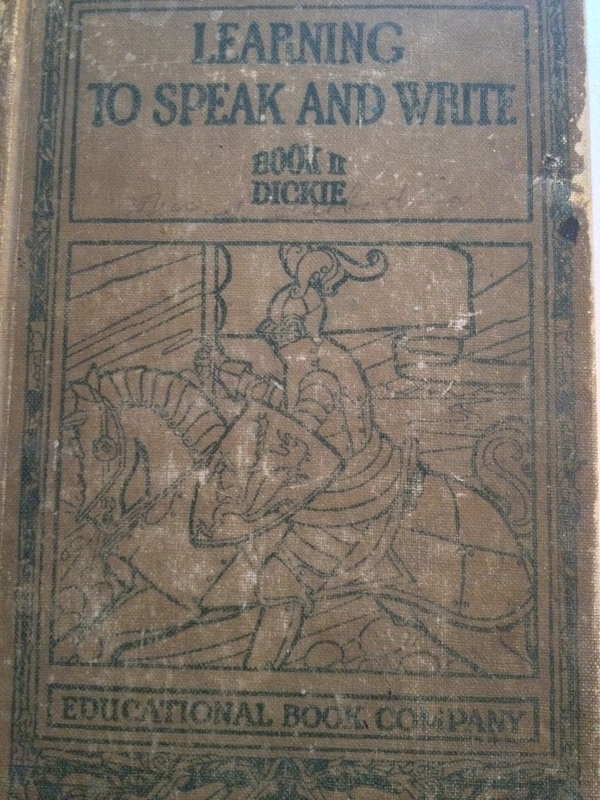 While my aunt and mother were going through to clean out his room, they came across a book on my grandfather’s bookshelf titled, “Learning to Speak and Write”. It was published in 1924. When I opened it and read the foreword to teachers, I was shocked and disgusted. This is a relief to me, as growing up, I never felt like I was “smart”. I was the kid that was pulled from class to go to the reading resource room. I have never been a strong writer, in fact this is my first blog post. I have been building up the courage to write for the past 5 months. Number smart would also not describe me. Strange that I wanted to be a teacher, even though I was never a strong student. I’m watching Colin be included in ways that I never thought possible! It’s because of their teachers that are willing to take risks and put in the “front end loading” time! It is often messy and not always perfect…but the moment when a student is trying to figure out which word will best describe a WHMIS symbol to a non-verbal student who uses an AAC device….that’s when you know you are achieving UDL!!!! He has also been fortunate to have amazing EA’s working with his teachers. They play a huge role that is often over looked. I know when I worked with Lynelle she was great with giving me ideas, even on the fly of how we could include Colin as much as possible. EA’s have a different view of our classroom. They see things that we miss or did not think about. I love that you are sharing Colin’s journey through videos. It shows people what is possible. Sharing your experience is so powerful and can help others think outside the box of possible ways they can work towards true inclusion in their classrooms. I am excited to be invited into Colleen’s science class next week. She is doing amazing things with amazing people like you! Change is always difficult and more often than not messy. I can’t agree with you more Christine, UDL is not a fad. It is a path to our future in education. It is time to change our traditional model of schooling. So glad we have professionals like you leading our way.